Ladies if you're looking for a sweet new theme for your BlackBerry, you'll feel like a kid in a candy shop when you see the new theme from Walker Themes. This new edition is called Lollipop, and has a ton of great details that are sure to delight you. Featuring a colorful set of icons and perfectly matched font, the theme also features a unique set of Fleur-de-lis battery and signal meters in each top corner. 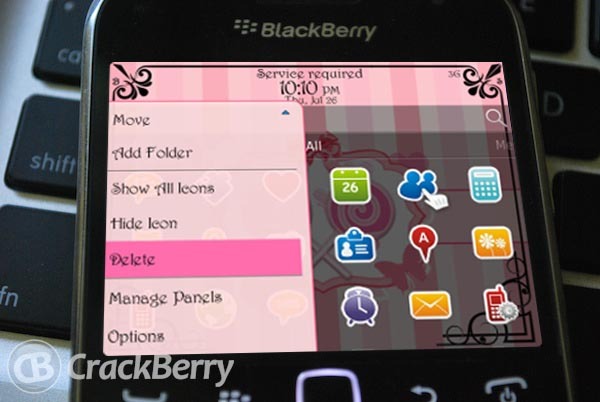 Pink menus and transparent backgrounds round out the wallpaper friendly theme. You can own Lollipop for just $1.99 on sale now (will be regularly $3.99) for your BlackBerry. Girls, you're going to want to pick this one up while it's on sale, and guys, why not surprise your special lady friend with a new theme for her 'Berry? It's compatible with most available OS' and devices, including BlackBerry 7 devices! Grab it now in App World at the link below.